Last night was Hamburgers & Hamlet night for Firecracker and I. We went to see Jude Law play the melancholy Dane, and I realized that a block over was HB Burger, which slider scientist Nick Solares of A Hamburger Today gave a rave review. So we had to go. I don’t often brave Times Square, because there are few good eateries due to the tourist trade. House of Brews on 46th is a favorite, and the Heartland Brewery & Chophouse is a decent franchise that makes good beer and above average food. 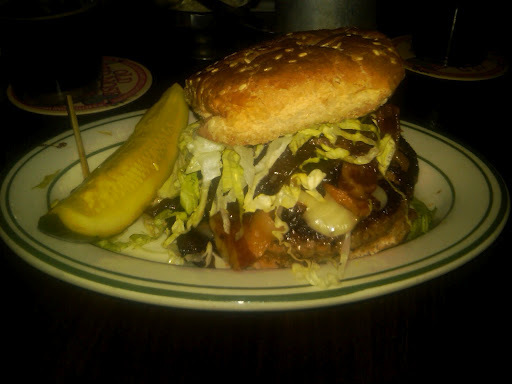 So when I realized that HB Burger is a burger-only annex of the chophouse, I was a bit wary. There was a short wait for a table and they seem to be running a bit slow, probably due to sharing kitchens with the bigger place, but the service was alright. It took us a while to order and get our beers- a Bavarian Black Lager for me, and a Rooster Red Ale for Firecracker- and she ordered a Red Nose Ale. Oops. The Red was a fine specimen of an Irish Red Ale, one of my favorite varieties, and the Black lager was a bit too malty and heavy for the style, but had a great smooth finish. It was almost like an oatmeal stout, but lighter. Both very good brews! They offer some fancy burgers- a filet mignon, a Kobe, a prime aged ground steak burger- but we opted for a free range Bison, and their standard HB. 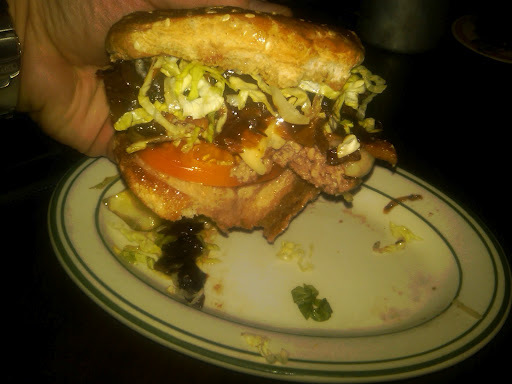 Firecracker had the bison with avocado, caramelized onions, cheddar and mayo; I had the HB medium rare with bacon, pepper jack, and their onion marmalade. We both had wheat buns; their standard is a potato roll. In retrospect, I’d recommend the potato roll, and getting the bison rare. The avocado was… half an avocado, which keeps slices from falling off, but makes it harder to eat. The burgers are cheap for the area- $7.50 for an HB- but fries are extra. The fancy burgers start at $14 and come with fries. You can also get sashimi grade tuna, a crab cake burger, turkey or veggie; I was hoping for lamb, but maybe another time. 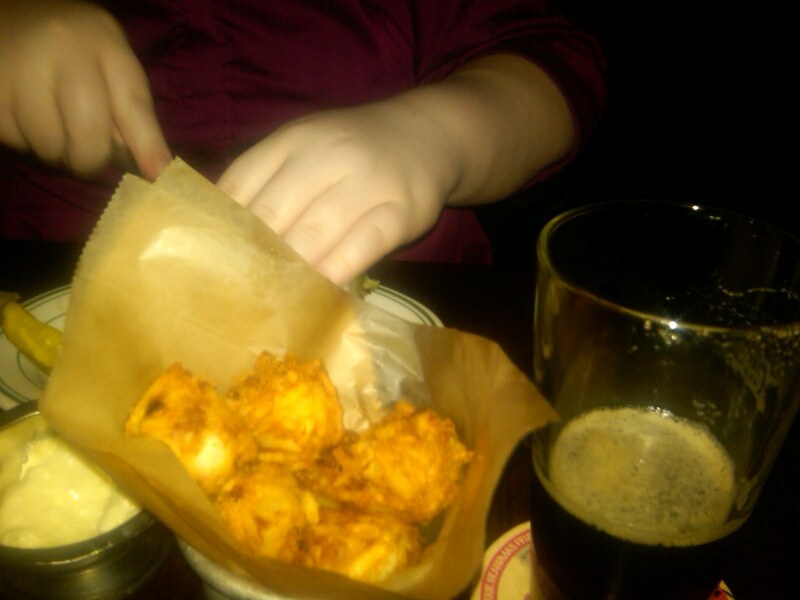 We also ordered tater tots, which are fried mashed potato balls with a hint of cheese and bacon. But on to the burgers! 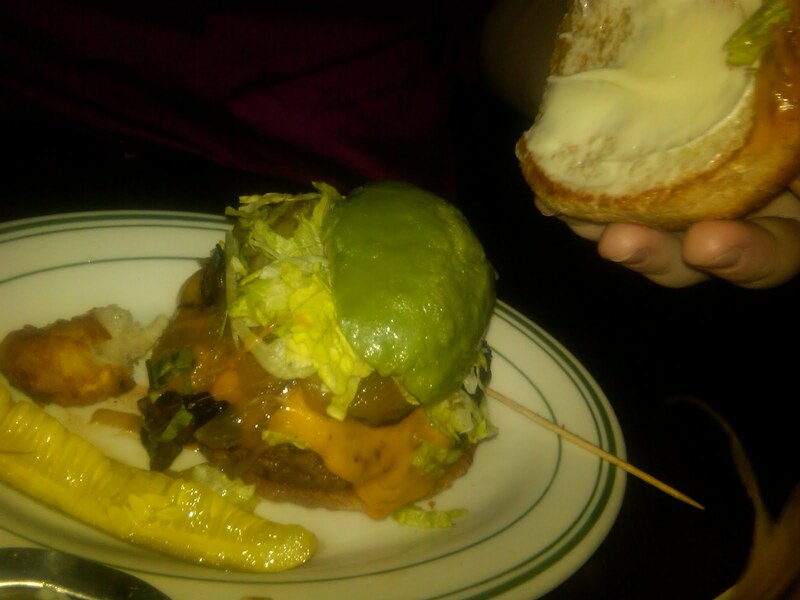 Firecracker’s bison burger was expectedly drier than the beef burger, but it was still juicy enough and full of flavor. But the real winner here is the HB burger, which as promised, was incredibly juicy and flavorful with a thin salty crust of sear on the outside. I’ve had more flavor, but this is one of the juiciest I’ve had in a long time. Island Burgers and 5 Napkin might be able to compete, but this is a nice compact package of flavor. I’d compare it to a Ray’s Hell Burger, but you have to go to D.C. for those. So we’ve got a new contender in the Top 5 Burger list, because I liked how juicy this was without being humongous, like the Island and 5 Napkin are. And you can’t beat the price. You can’t handle the juice! Times Square does have a few good spots nearby to eat- the aforementioned House of Brews, Sake Bar Hagi, and now HB Burger jumps into the fray. You won’t be disappointed, and it will assuage the disgust of being in a tourist hell hole. i want a real HB burger now!